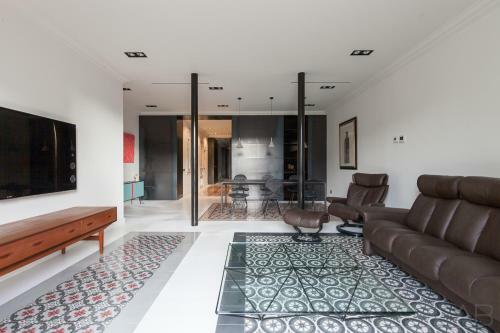 Situated in the Eixample district in Barcelona, this air-conditioned apartment with modern décor is 200 metres from La Pedrera. The unit is 700 metres from Casa Batllo and 300 metres from La Pedrera. The apartment features a minimalist design and comes with 3 double bedrooms, 2 bathrooms, an elegant kitchen and a spacious living room with smart TV. There is also 2 balconies at the apartment. Tivoli Theatre is 1.2 km from High Luxury Apartment, while Plaça Catalunya is 1.3 km from the property. The nearest airport is Barcelona El Prat Airport, 13 km from the property. This apartment features 3 double bedrooms, 1 en suite bathroom and another bathroom. The apartment also includes a living room and a dining room with smart TV. A spacious kitchen is also featured. Rate: € 400.00 ... € 627.50; select dates below to get current rates.